“A short story of how this all came about. 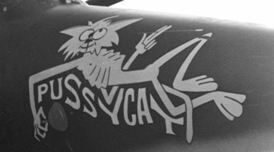 I'm a little bit of a nostalgic and liked nose art of WWII. About half way through our tour at Udorn we were given our own a/c. Mine was “6902”. Tom's was 936, I believe. 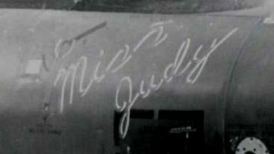 So one night I went down to the flight line about midnight (either Tom Mahan or Rodney Trimble helped me) and we painted "Miss Judy" on the nose to name my jet and honor my wife. 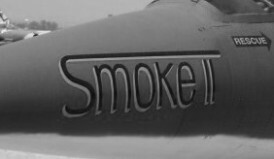 Obviously guys noticed the next day, and the Sqdn Cmdr didn't make me take it off, so within a week all the aircraft got nose art. Some of it got out of hand. Somebody candy striped the refueling probe and wing tanks with stars and stripes. At that point LtCol Presiado laid down the rules. 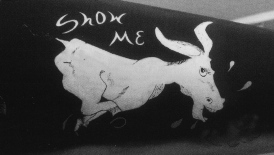 One piece of nose art that didn't stand out too much (spoil the camouflage). I had "Miss Judy" on the nose (both sides) and Rodney Trimble and I both had the Texas Flag on the rudder damper (small damper at the base of the rudder on the C-model -- just the right size and shape for a flag). It was all good fun and great for morale. It is interesting to see that these nose art has been used a while by the 198th FS Puerto Rico ANG although soon the aircraft got well deserved maintenance including the removal of the paint work and ECM systems. Interesting photo (although sadly very rough) showing 56-929 "Nancy J" and 57-916 "Time Hog" on the Udorn Air Base platform. 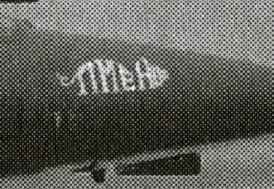 An other interesting subject showed to be the specific painted parts on the tails. The lowest part of all rudders (named jaw dampers) had the white-red striped flag, lateron with the Puerto Rico ANG they were changed into the Puerto Rice flag sign. However two aircraft had a big red/white with star flag of Texas on this lowest part (yaw damper) being The “Debbie Sue” 56-927 from Rodney Trimble and “Miss Judy” 56-902 from Ace Rawlins. In a way these two aircraft were quite unique. But there was an even more unique rudder found at Udorn, being the tail rudder from aircraft 56-898 and 57-923. Both carried a blue rudder with US stars painted on it. Films taken at Udorn AFB?? Years ago we saw an interesting short piece of film by Tom Delashaw. 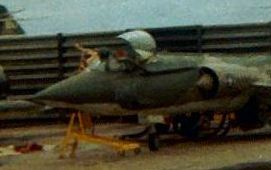 It showed the F-104Cs departing from George AFB, flying to Udorn. One of the stops at Hickham AFB was shown too. Then at last after also watching some shots taken while in flight-refueling, the aircraft were seen arriving at Udorn. Some shots taken at the airbase showed buildings of the “Jolly green Giants”, the 555 TFS and a flightline full of camouflaged F-101 Voodoos. On the base a plate showed “SAWADHEE STARFIGHTERS” and who knows what this means? Another interesting fact was that the tower did not carry the name UDORN but “ÜDON AIRPORT” in stead!!! Sadly, there was no sound with the film but nevertheless the fragments are very unique.. At the end there were also some fragments of the test of centerline carried ECM equipment, which we discussed years ago in one of our ZIPPER magazines. 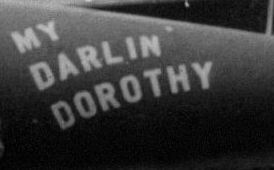 We are very interested if someone knows any other film taken at Udorn AFB, or Da Nang (earlier). Please tell us since these kinds of films must be saved for the future!! !